The Campus Transit System, which is funded each semester by a transportation fee paid by all students, provides bus service on a no-fare basis. The buses run on a regular schedule to all parts of the campus and in adjacent residential areas. 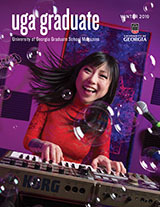 Furthermore, the City of Athens and the University of Georgia have an arrangement that permits students to ride any Athens Transit System bus without charge upon presentation of University of Georgia identification card.